In September, Andrew Trimble became Ulster’s joint-top appearance holder alongside Roger Wilson. That same week Trimble also lent his voice to the Tackle Your Feelings campaign. Here, Trimble chats with Ryan Bailey of The42 about his mental wellbeing and dealing with the frustrations associated with the injury. THERE WAS A lovely moment shortly after the full-time whistle at Kingspan Stadium a couple of weeks ago. Ulster and the Cheetahs had just produced an incredibly physical and entertaining contest on the opening night of the new season, and both sets of players embarked together on a lap of the pitch to show their appreciation for the support inside the ground. 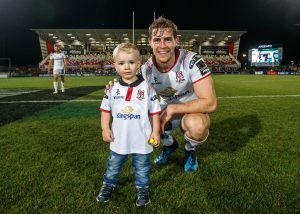 Down below the press seating in the Grandstand at Ravenhill, Andrew Trimble stopped where his young family had made their way around to and brought his young son, Jack — who was kitted out in the latest Ulster jersey, out onto the pitch. It wasn’t the last game of the year or a trophy celebration, but watching the Ireland international share those moments with his wife and kids was a nice reminder that rugby players are normal human beings too. Sometimes we can lose sight of that. We analyse and dissect their every movement on the pitch, and most of the time their actions off it too, and view and portray them as these herculean-like figures who are well-oiled machines tuned to perform to the highest standards both mentally and physically. There is also the preconception that rugby is a game of unadulterated masculinity; fast, ferocious and brutal. Players are immortal, unbreakable and untouchable — they are immune from fragility and exempt from weaknesses — but the reality is different. In fact, the reality is very different. In a recent survey carried out by Rugby Players Ireland, results showed as many as 41.7% of professional rugby players in this country have reported symptoms of anxiety and/or depression. Furthermore, 93% admit they worry about team selection and 70% worry about what the future holds once their rugby career ends. These findings and figures are even more startling when you place them side-by-side with national surveys which have found one in six people in Ireland will experience anxiety and/or depression every year. Regularly portrayed as infallible beings, it’s now fact that rugby players face many of the same stresses, strains and difficulties that accompany any profession. Granted it is a handsomely remunerated profession and it is a player’s choice to pursue a professional career, thus placing themselves on a platform from which people will judge, scrutinise and criticise their actions — but that does not trivialise the issue of mental health in rugby in comparison with any other section or sector of society. In a cafe in Belfast city centre on Wednesday, Trimble joined three of his Ulster team-mates on their day off from training for a regular catch-up over coffee — only the conversation this week was different to other weeks. The 32-year-old, Stuart McCloskey, Darren Cave and Craig Gilroy are the latest players to be the focus of the ‘Tackle Your Feelings’ campaign and are lending their support to a cause which has helped break down the stigma around emotional vulnerability in rugby. “Initially I thought it would be awkward but it ended up being the most normal thing ever,” Trimble tells The42. “Behind the jersey and away from the cameras people can forget we are just regular guys who wake up like everyone else with headaches and stresses. “This is about going for a coffee with a couple of friends and just being open and sharing your feelings with them. If you’re not feeling okay it gives you the chance to be honest with each other. It’s pretty normal to feel stressed or under pressure and it’s something we experience in our environment too even though it’s typically considered quite a macho environment. “I want to contribute and help in whatever way I can and we’re in the privileged position to be able to do something. To inspire others and urge them to speak up and share their feelings with someone you trust.” Trimble recognises that his profile as a 70-time capped Ireland international means he can make an impact and help change attitudes, break down the stigma and get people talking — but most of all it has helped change his perspective. From the outside, the winger is seen as a laid-back, unflappable character. He is hard-working and driven and to the public he comes across as a player who oozes confidence. To a large extent, that’s true but there is another side to Trimble; one which worries and stresses over injuries and form and questions why he continues to play the sport when things don’t go his way. Understanding those feelings and having a better appreciation of why he is feeling like that at certain times has helped him manage his emotions and open up to his family and friends about the burdens which can often weigh heavy. “Whatever your job is, when things are going well and then when they aren’t going so good you can feel the difference and the way you hold yourself or engage with people,” he continues. “For me, if things go well or even if I have a good training session or a good game then I feel like I’m just untouchable and I’m bouncing all weekend. Injury is the one that gets me down though. If I pick up a knock or injury I just think ‘oh here we go again’ and I just think I want to do something else with my life. “It’s just so ridiculously dramatic and such a dramatic swing in emotions so it’s about levelling that and coming to terms with that and being honest. Admitting you’re feeling crap today but identifying why you feel like that and talking about it. “Before I would have been reluctant to talk about my feelings. My personality is generally to keep things to myself but I’ve become more aware that it is important to share my feelings with someone you can trust — but also to identify it yourself. In the past I wouldn’t have even identified feeling disappointed or frustrated with being injured but now I can see it and understand why it happens. That makes things a lot easier.” Trimble needed to be able to recognise those feelings more than ever last year. A foot tendon issue, hamstring trouble and then a broken bone in his hand meant he played just 11 times for Ulster last term and when the word injury is pluralised in a single season, the mental strain is so often harder to bear than the physical rehabilitation work. At times, Trimble sank to deep lows as he faced lengthy periods on the sidelines and the frustrations were beginning to spill into his everyday life at home. He explains: “There have been a number of occasions when I’ve hit rock bottom. I absolutely love rugby and I’ve been very, very fortunate I’ve had the chance to play professionally and play a sport I love with a lot of my good mates. I am very lucky but I’m also aware I might only play one more game and pick up an injury which means the rest of my career doesn’t work out the way I want it to. It’s just perspective, that’s important for me now. “Whenever I get injured, I think I can’t do this anymore and I’m going to do something different but the thing is that if I had another job you’d have the same kind of stresses and pressures, just in a different way. It’s important to deal with them whatever your profession and I’m learning to do that. “Having two young kids has put perspective on things, too. I love getting the chance to take my wee fella for a bike ride or kick a ball with him and there’s lads playing rugby taking knocks and everything is achy and they’ve sore backs at the age of 30. There’s a big thing with concussion as well and these are all things that I’m aware of. “I’m happy to take a risk with a lot of these things because I love the sport and the game but at the same time the rest of my life is so much more important. My wife and my kids, being active and being able to go on holidays and living a normal life. That perspective is quite important to have that and it helps with coping with disappointments in rugby as well.” At the moment, however, things are going well for Trimble and Ulster on the pitch. The northern province have opened the new season with four wins from four and will look to make it five when they face Zebre later today. The game will be a landmark one for Trimble, who not only captains Les Kiss’ side but will equal Roger Wilson’s record of 221 appearances for Ulster 12 years after his debut. “It’s probably tempting to fall in love with ourselves a bit and it’s all singing and dancing,” he says of Ulster’s encouraging start as they look to end their 11-year trophy drought. “We’re four from four, we haven’t put a foot wrong yet but there’s definitely moments in games we can do better. We can execute our skills better and we can get our shape better and our defence can better. There’s a lot of things we can continue to work on and there are big tests around the corner. “We say this every single year: there’s something special about this group of lads but genuinely it does feel like something is going on this year. All the work we did in the summer on our phase play and shape has given us the ability to play with confidence and composure and really test sides. We’re really excited about that and where it can go. Last couple of weeks it has come on loads and three or four weeks down the line hopefully we’ll really get into our strides and express ourselves. “There’s something going on at Ulster, we’re excited about training, we’re excited about playing and we’re excited about spending time together. 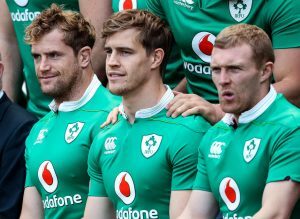 The squad is very close at the minute.” And it’s clear Trimble is enjoying rugby again. He never lost his love for the game but there’s only so many setbacks one player can take so it’s encouraging to hear he is back to full fitness now and feeling as strong and as sharp as ever with a full pre-season behind him. He will finish his Masters degree in finance from Queen’s University in a couple of weeks and is constantly keeping one eye on interests and opportunities outside of rugby to ensure there is a smooth transition once he does hang up his boots. But right now, the focus is on Ulster and, to a certain extent, Ireland. With the November Internationals fast coming around the corner, it would be a lie to say Trimble hasn’t considered getting back involved this Autumn having missed the last two games of the Six Nations as well as the summer tour to USA and Japan. Having featured in 10 of Ireland’s 11 games in 2016, Trimble has played just once for Joe Schmidt’s side in 2017 and while he insists his primary goal is to reach peak form with Ulster, he knows if he can achieve that in the coming weeks there’s every chance he’ll be back in the international fold when the Springboks visit Dublin. “Regardless of where I’m at with Ulster, November doesn’t exist to me until I play well enough to make it happen,” he says. “There’s a lot of competition for places at Ulster and it would be ideal to be involved with Ireland but for me I just want to be involved at Ulster and play and perform well. Just get back feeling confident and powerful. Go out and express myself and once I get there I’ll start thinking about Ireland again.” Trimble is in a better place both mentally and physically in this his 13th season as a professional rugby player with Ulster, and certainly the working environment he walks into everyday now is a lot different to when he started. “The attitude in the dressing room towards mental health and towards talking and being open is changing,” he adds. “I don’t think it’s something that will totally change as the culture isn’t going to shift overnight but it is something that is gradually changing. Young guys are coming into the squad and having an impact and being more aware. If we can facilitate that then it makes all this worth it. “Players aren’t being influenced by that traditional macho rugby culture anymore and the older guys as well are coming around to it too. It’s probably not what people imagine it is. The stereotypes are a million miles away from the reality. 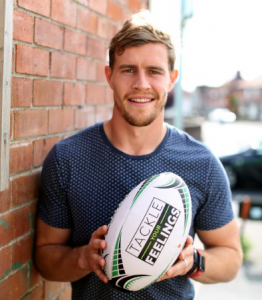 At the end of the day we’re just normal guys who happen to play rugby.” Ulster’s Andrew Trimble, Craig Gilroy, Darren Cave and Stuart McCloskey have put their voices behind Rugby Players Ireland’s Tackle Your Feelings mental wellbeing campaign, in association with Zurich. More info can be found here. Ryan Bailey This article appeared in The42.ie on Saturday, September 30th 2017. It is reproduced here with the kind permission of the author.